I wasn't even going to write about this, because I've never listened to Bill Carroll on AM radio. 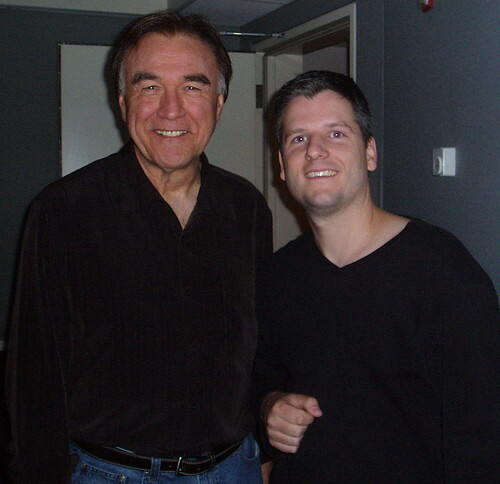 I faintly remember him appearing on Test Pattern with Dan Gallagher and I heard him host Barometer on Q107 back in the day, but I completely missed his body of work with the old TALK 640 and more recently on 1010 CFRB. Since I'm neither a Bill Carroll fan, nor an AM640 listener, I figured a tweet was sufficient to share the "too hot to just be a rumour" news that Bill Carroll will return to Toronto airwaves with an afternoon spot on AM640. Multiple sources tell me this is happening. Bill Carroll currently hosts The Bill Carroll Show on KFI in Los Angeles, so will Bill Carroll be hosting the AM640 show from LA or is he moving back to Toronto? 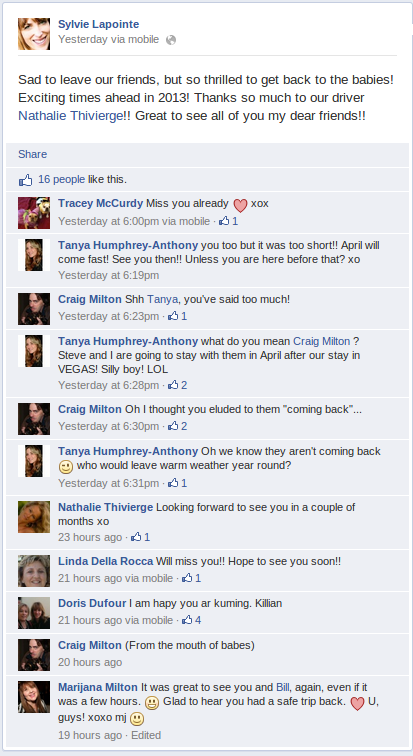 His wife's Facebook page gives us a clue. Please note, I'm sharing this screen cap b/c it's publicly available. It sounds like a move to Toronto might be in the works for April 2013, if you read between the lines. It's subtle, but it's there. Is Bill Carroll going to host afternoons on AM640? Will he be moving to Toronto to do so in April? Does anyone care? Update: Bill Carroll will be doing the AM640 Toronto show out of LA. 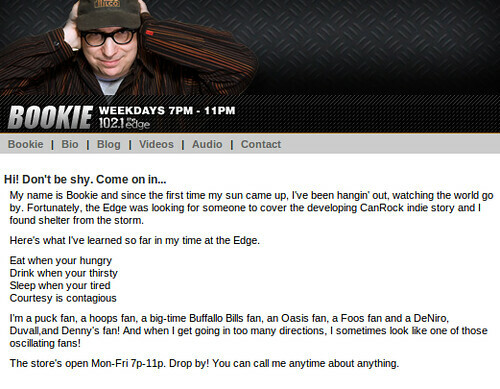 Dave Bookman, better known as Bookie on the radio, has been fired from CFNY / Edge 102. He had been on the air there since 1991. Dave Bookman was the last on-air holdover from the 90s. When Alan Cross was fired in the summer of 2011 we feared Bookie would be next. He was older and probably making a decent salary, but he was passionate and knowledgeable about the music. I always enjoyed listening to Bookie talk about the music. Here's Bookie's bio from edge.ca where you'll still find it. I suspect it won't stay there much longer. I try not to do this too often, but I'm going to start this entry by sharing something I wrote almost four years ago. I called this How Should Newspapers Make Money Online? and I originally published it on February 17, 2009. I actually feel sorry for the newspaper industry. I don't know about you, but I read almost all of my news now online and I don't pay a cent for any of it. I want it all, I want it instantly and I want it for free. When people Google Andy Barrie's name, looking for information as to when he'll return to CBC Radio One, my blog entry on the subject is ranked #2. One of the few mainstream press articles on the subject belongs to the Globe and Mail, only they've hidden their article behind a form. You can't read the Globe article on Andy Barrie's leave of absence without buying 30 days access to it for $4.95 + tax. You can buy four articles for 30 days for $17.95 + tax. At first this angered me. I don't want to spend over $5 just to read a single article online. The web is about articles being online forever and for free, right? And isn't $5 steep for a single article to be available to me for only 30 days? I don't really know how newspapers are supposed to make money online in this day and age. I know I didn't pay the $5, and I'm not sure how many people out there would. In fact, just having the article offline will likely push people to other newspapers. How should newspapers earn an honest buck in this age of the Internet, or are they S.O.L? There is no additional cost for Globe Unlimited for those who have a five- or six-day home delivery newspaper subscription. For those with partial week subscriptions, including Friday/Saturday and Saturday only, we are offering Globe Unlimited for a substantial discount at $4.99 per month. For those who prefer to read online only, we are offering a trial subscription to Globe Unlimited for 99¢ for the first month, after which the cost will be $19.99 per month. Casual visitors to globeandmail.com will still have access to 10 free items each month (including articles, videos, slide shows and other features), after which they will need to subscribe to Globe Unlimited to see more. The Globe homepage, section fronts, videos, stock quotes and Letters to the Editor will all remain free and accessible to the public, and will not count toward the monthly limit. This model is definitely better than their previous paywall model, but will people be willing to spend $19.99 per month for something that was completely free until yesterday? Be honest, would you spend that kind of money to access quality content online? My old Buddy Rick Hodge is back on the air as co-host of Niagara's 105.7 EZ ROCK Morning Show alongside Lori Love. Following an eternity doing mornings on 104.5 CHUM-FM, Rick Hodge was most recently a part of 97.3 EZ Rock's Toronto morning team. I once sat in on a show and great controversy ensued. I kid you not! All's well that ends well, and I ended up working with Rick Hodge, attempting to teach him social media and helping him blog. The blog is now dead and I haven't heard from Rick in months. But I'm very glad to hear Rick Hodge is back on the air where he belongs. Here's an interview I conducted with him in which he reveals the truth about why he left CHUM-FM. I listen to a lot of CBC Radio One these days, and Jim Curran is the soothing voice I hear delivering traffic reports. I no longer commute to work, but I still enjoy his calm delivery. There's 40 years of experience in that voice of his! Jim Curran is retiring at the end of March. 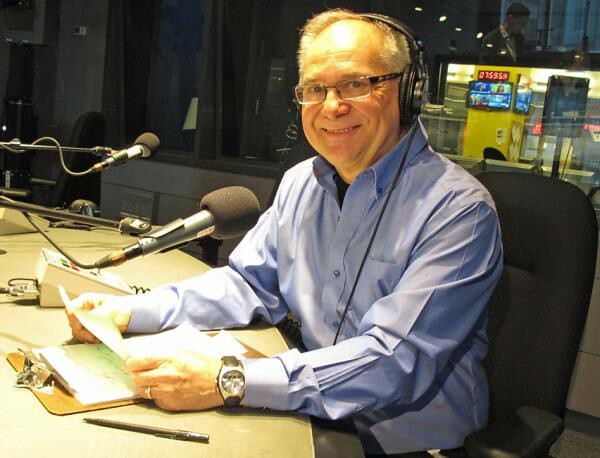 He's been at CBC Radio doing traffic since 1972, and I'll miss his voice. Humble and Fred received a letter from Corus Entertainment Inc. this morning. It was from one of Corus's "Trade-mark Agents" and it was to the attention of Howard Glassman and Fred Patterson at Humble and Fred Worldwide Studios. "Entertainment services through operation of a radio station providing services including radio broadcasting; gathering, producing, programming and disseminating of music, news, information, public service messages and entertainment in all forms for radio; radio broadcasting services and related commentary and news broadcast on radio." We understand that you have registered the domain name www.humbleandfred.com and have started your own internet show as of October 15, 2011. In light of the fact that Corus owns the HUMBLE AND FRED trade-mark, we are writing to propose a Trade-mark assignment of the above noted registration to you. This assignment will transfer Corus' ownership of the registration to Humble and Fred Worldwide Studios. We request a payment of $5,000 in consideration of this assignment. If the above is acceptable, please let us know. We will promptly prepare the Trade-mark assignment agreement for your review. The assignment, once finalized, will be submitted to the Canadian Trade-mark Office so that the change in ownership can be recorded. Humble and Fred called this Trade-mark Agent, who has advised them that it's not a joke and they've owned the trade-mark since 1998. What's interesting to me is that Humble and Fred appeared on a rival station, Mix 99.9, for years using that name, and Corus seemed completely fine with it, but now that Humble and Fred are podcasting, it's no longer cool. Corus Entertainment wants something for Humble and Fred's use of the name Humble and Fred, and they've named their price: a whopping $5,000. Alan Cross was fired by Corus back in July. Now, he's been hired by Astral's Orbyt Media division. He'll host a show called The Secret History of Rock with Alan Cross, which will sound an awful lot like his Ongoing History of New Music show we all know and love. Astral will air his show across Canada, and in Toronto on Boom 97.3. Alan Cross can have his little Astral gig, and Colleen Rusholme can enjoy herself on Vinyl 95.3, but the real fun will be had by Humble and Fred on Humble and Fred Radio! Bob Laine was 72. 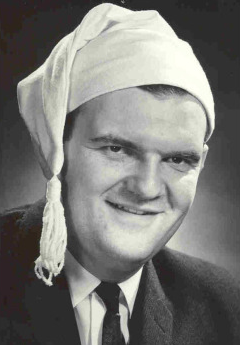 He was a radio broadcasting legend at CHUM known as "The Voice" whose signature opening was "Good morning world, this is Bob-O. Good morning Bob-O, this is world." Elwy Yost was 86. He was the long-time host of Saturday Night at the Movies and Magic Shadows on TVOntario. As a very young boy I remember watching Elwy on TVOntario as he introduced classic films I was far too young to appreciate. I fondly recalled Elwy in this space back in 2007 and again in 2008. Then, I decided I could be Elwy Yost. The man's enthusiasm for movies was contagious. Thanks, Elwy. Speaking of Toronto morning radio hosts getting fired from Astral-owned stations, my buddy Marc tells me Billie from Mad Dog and Billie has been fired from Virgin Radio. According to a source, Billie - whose real name is Amanda Dunn - was canned from the station today after five years. She and Mad Dog (whose real name is Jay Doudelet) previously worked together for three years on 98.1 CHFI following a stint at KISS 92.5. Dunn's termination comes on the heels of the end of her marriage to Peter Luciano, a business lawyer with Toronto firm McCarthy Tetrault and former member of Canadian boy band VIP. The couple are parents to a two-year-old daughter. It's a strange coincidence that we learn about Billie's dismissal today. Back in 2006, it was Mad Dog and Billie who replaced Humble Howard when he was canned from Mix 999. Earlier today, Humble Howard broke his silence and wrote about being fired a second time, this time from Boom 97.3. Billie won't likely be resurfacing at Boom, as Stu Jeffries has that morning gig. Yes, the very same Stu Jeffries who was canned from his gig with Colleen Rusholme at EZ Rock and replaced by... Humble Howard. See how Toronto radio works?